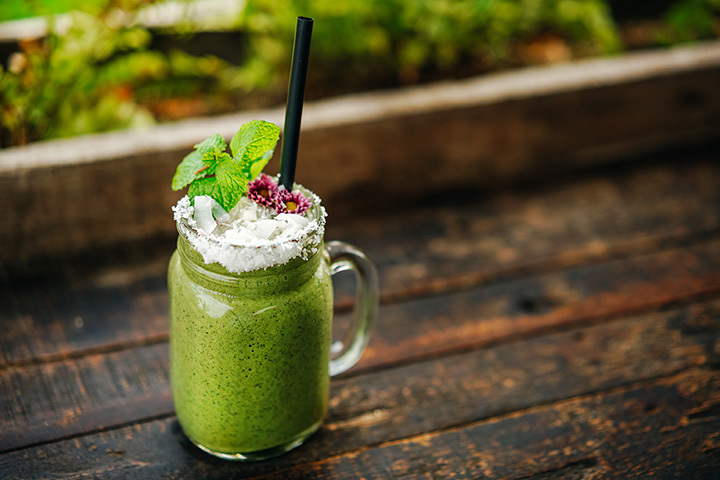 Whether it’s part of your daily gym routine or you simply want to indulge in something sweet, the super healthy smoothie places of Connecticut have you covered. Boasting super foods such as acai, goji berries, and more, these smoothies are so packed with goodness that they can act as a snack or meal replacement or simply as a boost for when you’re feeling a bit run down. Here’s where you can find the freshest smoothies in Connecticut. Pure Alchemy Juice Bar and Café aims to help you eat better by encouraging you to consume at least one raw vegetable or fresh juice/smoothie per day. The delicious food and beverages that they serve makes it that much easier, as you can opt from two sizes of smoothies in 20 different flavors. The smoothie flavors featured here are quite different from typical flavors you might be familiar with such as their Lavenberry Dream, which is made from dried lavender, nut milk, blueberries, banana, and maple syrup. Find the local plant-fueled community at Green & Tonic and indulge in fresh, seasonal produce, with a focus on clean eating. The menu at Green & Tonic is packed with superfood smoothies that come in three sizes as well as acai and smoothie bowls for a healthy start to the day. A smoothie highlight is the Pumpkin Flax smoothie, which is made with almond milk, bananas, apples, flax seed oil, almond butter, pumpkin puree, pumpkin pie spice, and vanilla protein powder. The menu also features salads, wraps, soups, and bowls. Fuel your body and your mind with a selection of healthy foods and drinks at Embody Fitness. This gourmet foodie destination is perfect for health food lovers or those trying to take better care of their body by watching what they put in it. Here, you’ll find juices and smoothies, chia pudding, nut butters, and granola. Smoothie offerings include those incorporated with nut butters, fruity smoothies, green mixes, and even classic flavors like strawberry banana. Enjoy a full menu of healthy food at Catch a Healthy Habit Café, where you can feel like you are indulging, but everything is packed with vitamins and minerals. Choose among 22 freshly made smoothies in sizes small, medium, or large. Smoothie options include Holy Caco, which is almond milk, banana, cacao, mesquite, and coconut sugar, or Key Lime Pie, which is almond milk, banana, lime juice, spinach, dates, and vanilla. Catch a Healthy Habit Café also offers trendy smoothie bowls that include three add ins such as chia seeds, nuts, or fresh turmeric. Enjoy customizable smoothies and smoothie bowls at Karma Kitchen Juicery, a relatively new establishment located in the historic downtown Mystic. Smoothie flavors include the Peanut Butter Protein Bomb, Pineapple Blast, and Acai Berry for a massive boost in antioxidants. The menu also features Bulletproof Hot Coffee (made with butter), cold-pressed juices, wraps, salads, and soups. Juiced Up Juice Bar is a juice, health tonic, and smoothie bar that focuses on creating fresh drinks that are high in antioxidants. These juices and smoothies can help boost your immune system, lose weight, and enjoy clearer skin. Juiced Up Juice Bar also offers healthy lunch options such as jerk chicken wraps to go with your smoothie. They also offer a loyalty card, so after you make a number of purchases of fresh smoothies, you can enjoy one on the house! The Fresh Monkee focuses specifically on fruit shakes and smoothies that only incorporate healthy, real ingredients—nothing artificial. Smoothie flavors include PB Jelly Time, PB Banana Fluff, Ultimate Green, and more. These smoothies are great post-workout as they are packed with protein and low in sugar. Find locations in Avon, Glastonbury, and Wethersfield. From Tuesdays through Sundays, dine on an entirely plant-based menu at Right Path Organic Café. They offer eight different smoothies on the menu including the tasty Namaste, which is made with fresh almond milk, buckwheat, dates, banana, and strawberries. The menu also features snacks, bowls, salads, soups, and healthy vegan and raw desserts. Indulge in organic, non-GMO smoothies, juices, and healthy meals at Fragrant Basil Juice Café. Freshly blended smoothies served at Fragrant Basil Juice Café features mixes to give you energy, boost your immune system, and detoxify your body. You can also customize your smoothie to get the flavor and health benefits that you desire from your drink. Macondo is a café serving coffee sourced from a fair-trade partner in Colombia as well as pressed juices and fresh smoothies. Smoothies include detox, green, and berry options, making them perfect for getting your daily serving of fruits and veggies. The location off of Route 1 also makes it easy to reach, so you can get your healthy smoothie fix even when on the go.